The Christmas Tree of the Day series has been running on Sparklette since 2006. You get 12 Christmas trees for the 12 days leading up to Christmas. It has become almost customary to feature at least one tree that is encrusted with sparkling jewels each year. We have seen trees with Swarovski crystals, white gold, and – the most precious stone by any standard – real diamonds in a year when the economy was still doing swimmingly. The jeweled tree for 2009 is this, a tree made of tightly strung crystals. 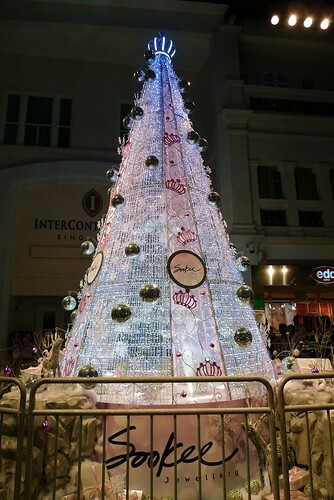 This glittering tree is located at the glass-covered mall, Bugis Junction. While this tree may not be as posh as the ones with actual Swarovski crystals and shimmering diamonds, it is by far one of the prettiest trees around. Unlike the conventional Christmas trees that are topped with stars or angels, this one wears a silver crown! Notice the anchors and life buoys hanging in the background? They are part of the running nautical theme of the mall. Here’s their one-of-a-kind nautical Christmas tree. OOOH! This Christmas “tree” is so shimmery and sweet. It’s practically a princess tree. Wonder if there is any real jewellery on it this year? In past Christmases they had signboards around the tree to let people know how many diamonds or jewels were used in the decorations. This year I did not notice any signboard. I haven’t noticed any real jewellery on the tree either.